54th Street Grill & Bar is a casual, neighborhood restaurant that serves great tasting food and drinks for lunch and dinner, in a retro style setting. While it’s not as inexpensive as fast food, the burgercentric menu is affordably priced. Menu selections consist of appetizers, steaks, baby back ribs, a variety of salads, sandwiches, burgers, Mexican dishes, and the famous “Gringo” dip. All menu items are made from scratch using quality meats & ingredients and fresh produce. For those who crave 54th Street Grill for lunch, try their Let’s Do Lunch menu items. A selection of 54th Street Grill favorites served in a timely manner. Kids need to eat also, so check out the Street Kids menu specially crafted for children under 10. 10 years and under please. Each “Street Kid” meal comes with your choice of Entree, Side Item, Drink and Dessert. Kids are always welcome at 54th Street Grill. Guests can sign up their kids to the Street Kids Birthday Club. Kids will receive a special gift from 54th Street Grill by mail on their birthday. Be one of the first to learn about new & exciting changes to the menu and receive special online offers delivered directly to your email inbox. All you need is an email address! The 54th Street Grill loyalty program is a way to show appreciation to frequent guests. Sign up is simple and free and for every $100 spent at 54th Street Grill, members earn $5.00 in OurStreet rewards plus awesome gifts. For guest with dietary restrictions, 54th Street Grill offers a menu with select items that are gluten-free and vegetarian. This special menu offers surprisingly affordable pricing. There are also a number of great side items on the standard menu that meet vegetarian requirements. Putting together a nice vegetable platter would be very affordable and easy! Guests are encouraged to advise the restaurant manager of any dietary restrictions. 54th Street Grill makes it easy for guests to know the nutritional values of the menu items. The website offers a detailed list of each dish along with a breakdown of data so guests can easily determine the nutritional values of their favorite dishes. 54th Street Grill takes guest safety and food allergies seriously. The website offers a complete list of known allergens found in each dish. Be sure to visit the website and review before heading out. 54th Street Grill proudly supports local community groups and organizations through donations and fundraising. 54th Street Grill offers special gift cards to charitable group with 501(c)(3) status. Check website for details or call the corporate office. Raising funds for school or local groups is simple with 54th Street Grill. A percentage of purchases from guests that participate in the event will be donated. 54th Street Grill is always interested in bringing new team members on board. Candidates that are self-motivated and passionate about exceptional customer service should consider applying at 54th Street Grill. 54th Street Grill offers a competitive pay and benefits package plus room for advancement. Check out the Career page on the official website to learn about hourly, management and corporate positions. 54th Street’s original restaurant was started in Kansas City by restaurateur Thomas E. Norsworthy, in 1990. Thomas envisioned a concept that combined great tasting food for diners to meet and enjoy and a gathering place where friends could meet to enjoy cold drinks and conversation. Today, there are 25 54th Street locations across several states. 54th Street Grill is headquartered in Kansas City, MO. Guests can follow and connect with 54th Street Grill through various social media platforms and get instantaneous updates. 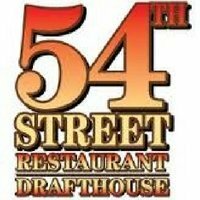 For more information about 54th Street Grill, visit their official website. Does 54th Street Grill have Happy Hour?